The Cambridge Animal Alphabet series celebrates Cambridge’s connections with animals through literature, art, science and society. Here, Z is for Zebrafish as we talk to eminent immunologist Professor Lalita Ramakrishnan about her research into new ways of treating tuberculosis. Professor Lalita Ramakrishnan shares her workspace at the Laboratory of Molecular Biology (LMB) with thousands of tiny stripy fish. Zebrafish have long been a favourite in domestic aquariums: they are strikingly pretty and constantly on the move. The zebrafish at the LMB, each one no bigger than your little finger, are helping Ramakrishnan and her colleagues to find novel ways of preventing and treating tuberculosis (TB). We asked her about her work. Around 40 years ago scientists began to realise that zebrafish, as vertebrates, could tell us a lot about human development and human diseases. This discovery represented a real breakthrough in terms of what could be achieved using zebrafish in laboratories. There are two key reasons why zebrafish, in particular, are so valuable. Firstly, when the new fish hatches as a tiny larva, it is optically transparent for the first two weeks of its development. This transparency means that, using powerful imaging technology, we are able to observe in real time the development of the organism as it grows to maturity. In our laboratory, we exploit the optical transparency to directly look at how the tuberculosis bacteria cause disease. The second reason why zebrafish is such a good model is that a single mating can produce hundreds of eggs – and female zebrafish are capable of producing a new batch of eggs each week. So we have access to large numbers of animals for the work. On top of all this, zebrafish are relatively straight-forward to keep and easy to breed. We can also create zebrafish with different mutations and we can then assess the impact of host genes on the course of disease. This kind of fundamental work enables us to identify, by a process of deduction and elimination, what genes do – which is essential to developing new medical interventions. But surely zebrafish and humans have little in common – we’re not fish! Humans and fish are much more alike than people might suppose – even though we diverged from our last common ancestor at least 300 million years ago. Most of the genes found in fish are also found in humans – and most of the genes that cause disease in fish also cause disease in humans. The human immune system, which fights off disease, is a lot like the immune system of fish. My research is focused on tuberculosis in humans – a disease that affects millions of people worldwide. Without treatment, TB can be life threatening. We tend to associate human TB with the lungs, and of course fish don’t have lungs. TB does affect the lungs but it can affect almost all our organs. In humans, some 40% of TB infection is not in the lungs but elsewhere in the body – brain, bone, kidney, intestine, reproductive organs. Fish are affected by a close relative of the human TB bacterium. If we can work out how TB works in fish, and how to prevent it and treat it in fish, then we’re a step closer to solving a major health problem in humans. What is the life of a laboratory zebrafish like? Our fish live in tanks that are kept pristine by a unit that cleans and circulates the water. We grow the food they need in the lab – it’s a kind of brine shrimp. Putting this live food into the tanks allows the fish to hunt for their food, creating a more natural environment for them. Zebrafish are sociable creatures so we keep them in groups. All our fish are on a programme of 16 hours of daylight and eight hours of night. This routine mimics, as much as possible, the natural environment in the regions of the world where they live. We make sure that they are as healthy and stress-free as possible. Happy fish are healthy fish – and the other way round! You can identify the males from the females by the roundness of the female’s belly. When we want a new batch of eggs, we put a male and a female in a tank overnight, with the two fish separated by a transparent divider. When daylight comes, the two fish become excited and we take out the divider and they mate. When the eggs are laid, they fall through a fine grill that enables us to take them out of the tank. All these procedures are done as carefully as possible so as not to harm the fish or eggs. How do you use the zebrafish eggs? In my laboratory, we’re studying TB so we need to infect some of the fish eggs, one by one, with bacteria so that we can observe what happens. This procedure is carried out under a microscope using a very fine needle that is hollow, enabling tiny amounts of bacteria to be delivered into the egg. 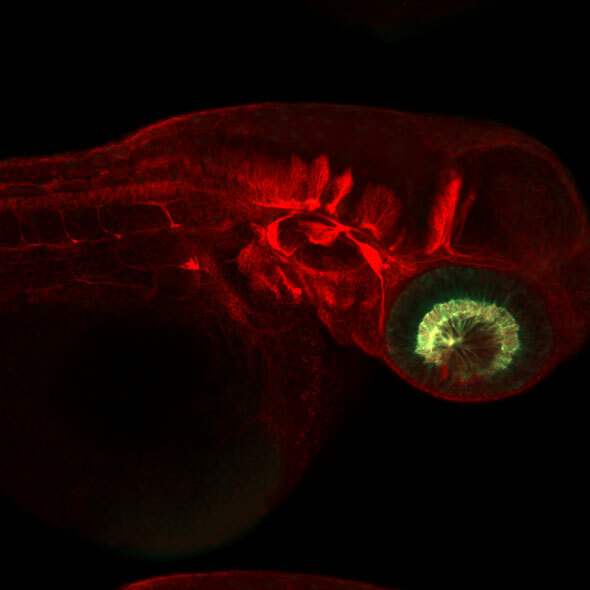 Because zebrafish eggs are so tiny, it takes a while to learn how to do this. It requires good hand-eye coordination and a steady hand – but everyone learns to do it with time and practice. Once the eggs are infected we put them into small dishes where we can observe them. Because the eggs and the larvae are transparent, we can observe the process by which the bacteria enters the cells – and we can watch what happens as the bacteria and immune system face off. By using fluorescence, we can colour the host (the organism affected by the disease) and the bacteria so that it’s easier to track what’s happening on a cellular level. We can, for example, observe how exactly bacteria invade and spread. How is your work with fish helping to develop better ways of tackling TB? At the moment, TB in the human population is treated with a long course of strong antibiotics – it often takes as long as six months to get rid of it. Strains of drug-resistant TB have developed, partly because people do not finish the courses of drugs prescribed to them. The work that my colleagues and I are doing suggests that there could be another, and perhaps more effective, approach to tackling TB. Rather than only targeting the bacteria, which are so clever in their invasive strategies, it might be better to additionally target the host and help the immune system to fight it off. We might do this by boosting or tweaking the immune system. We now need to put to the test our ideas for helping the immune system by trying out a list of available drugs – and, in the initial stages of the research, we will be using zebrafish as models. 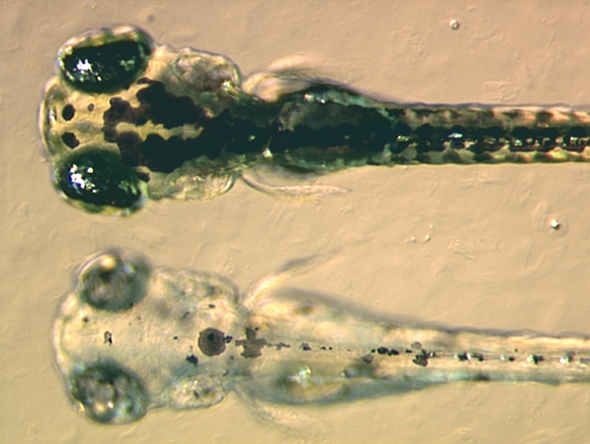 What’s the future for zebrafish as a model organism in research? The world of research using zebrafish is wonderfully collaborative and fast-moving. Our main partner is the Sanger Institute which is just a few miles from the LMB. We collaborate closely with the scientists there on tools and techniques – including producing the mutants in order to identify genetic pathways. Zebrafish are still relatively new in terms of their contribution to research – but it’s difficult to overstate how important they are. Every research organism has its limitations, of course. However, there’s much, much more we can learn from zebrafish that will benefit humans in the future. This is the last article in the Cambridge Animal Alphabet series. If you have missed the others, you can catch up on Medium here. Inset images: A two day old transgenic zebrafish embryo (Wikimedia Commons / IchaJaroslav); Zebrafish embryos (Wikimedia Commons / Adam Amsterdam, Massachusetts Institute of Technology). The text in this work is licensed under a Creative Commons Attribution 4.0 International License. For image use please see separate credits above. See original article here. Visit Elsevier Store to access books on zebrafish, animal modeling and much more! Below is a small selection of books that discuss these topics. Use discount code “STC215″ at checkout and save up to 30% on your very own copy! Atlas of Early Zebrafish Brain Development, 2nd Edition illustrates principles of vertebrate brain development and neurogenesis via the zebrafish model organism, providing users with in-situ hybridized and immunostained preparations of complete series of brain sections. The Zebrafish: Cellular and Developmental Biology, Part A, 3rd Edition is a complete compendia of laboratory protocols and reviews on the use of the zebrafish as an animal model of research.